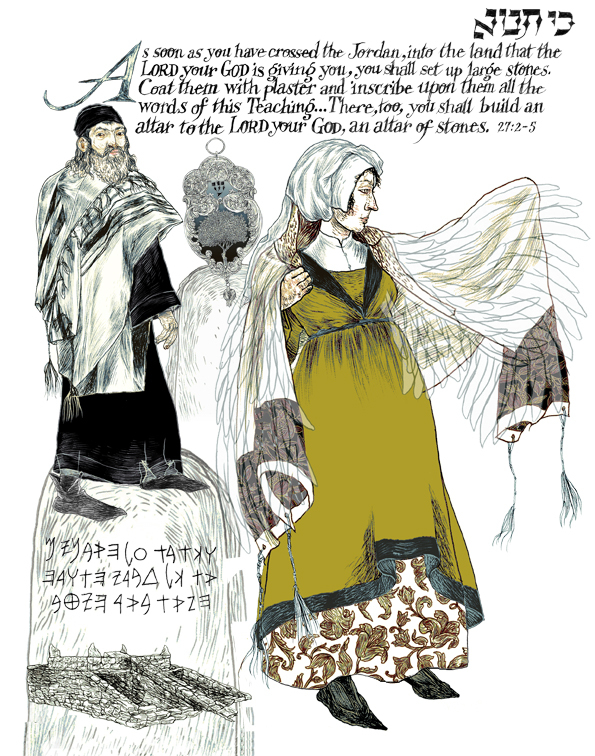 This week’s Torah reading, Parashah Eikev addresses the dramatic destruction of Canaanite pagan culture while symbolizing the spiritual fortitude required to do so. It stresses the importance of strengthening and maintaining our faith so that we may partake of the abundant gifts of the Promised Land. 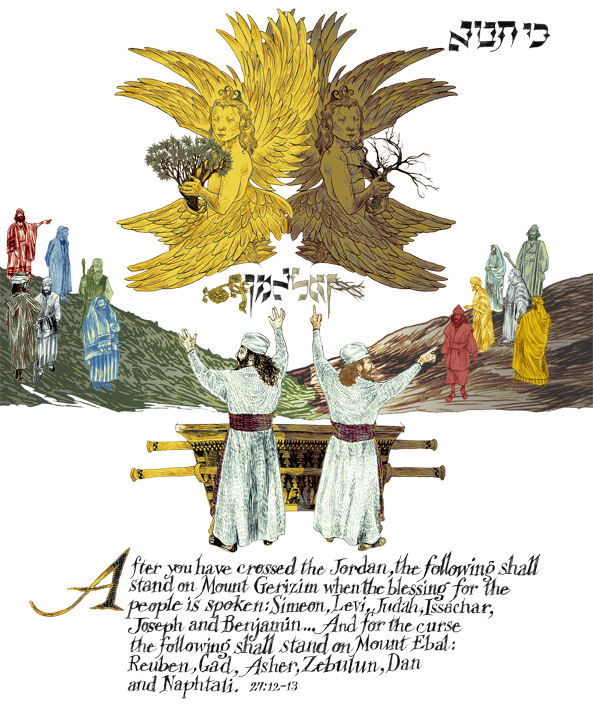 Today’s illustration, ‘A Partnership of Faith‘, is a detail from Between Heaven & Earth: An Illuminated Torah Commentary. 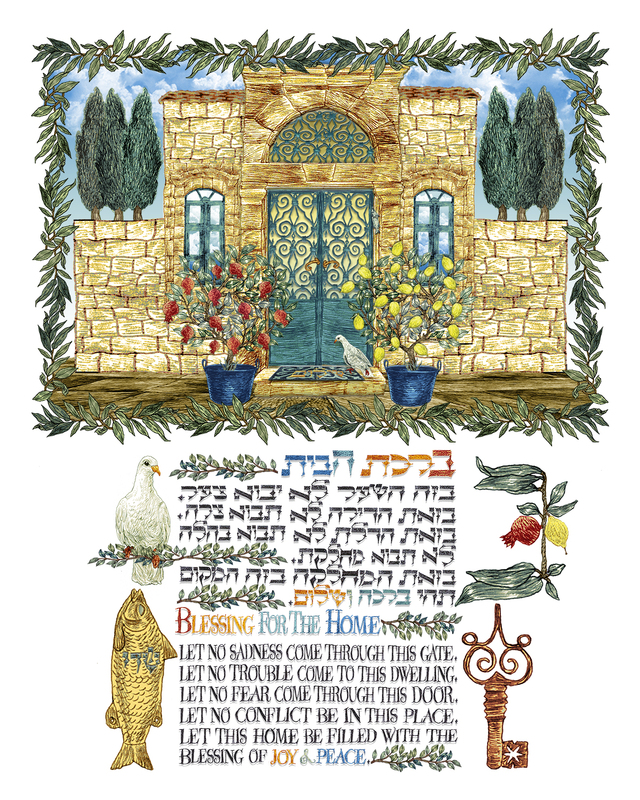 Here, a mezuzah amulet, similar to the one in Parashah Va’Etchannan reappears, now as a symbol of protection for settlement in Israel while presenting examples of the seven species of produce that will be found there. Blessing this process is a vision of the Shekhinah, the feminine aspect of God. The bird perched on her elaborate crown of pomegranates is a hoopoe. In addition to it being selected as the national bird of Israel on the country’s 60th birthday in 2008, the hoopoe was chosen to compliment her presence because of its legendary filial devotion and gratitude, caring for its parents as they age. This relationship is the metaphor of our partnership with each other and with God. 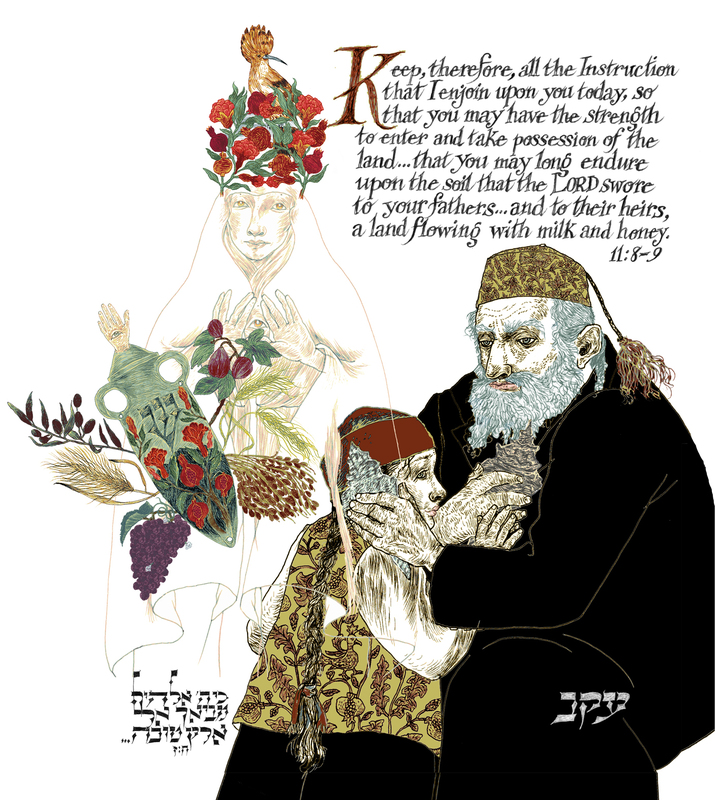 The Hebrew quotation below her from Parashah Eikev, Ch. 8, v.7 translates as: “For the Lord your God is bringing you into a good land, a land with streams and springs and fountains issuing from plain and hill…” This image is my response to the essential dual dynamic of hearing and being heard, that in turn validate each other. Once, long ago, I received a large conch shell as a gift. Holding it to my ear, I heard the expected rush of an ocean tide, but my imagination overlaid that sound with the notion of a mysterious communication originating from somewhere deep beyond the interior spirals of the shell. To this day, that communication remains a mystery, but the experience inspired the images in this image of a grandfather and granddaughter sharing a moment of mystery and faith that is older than memory. 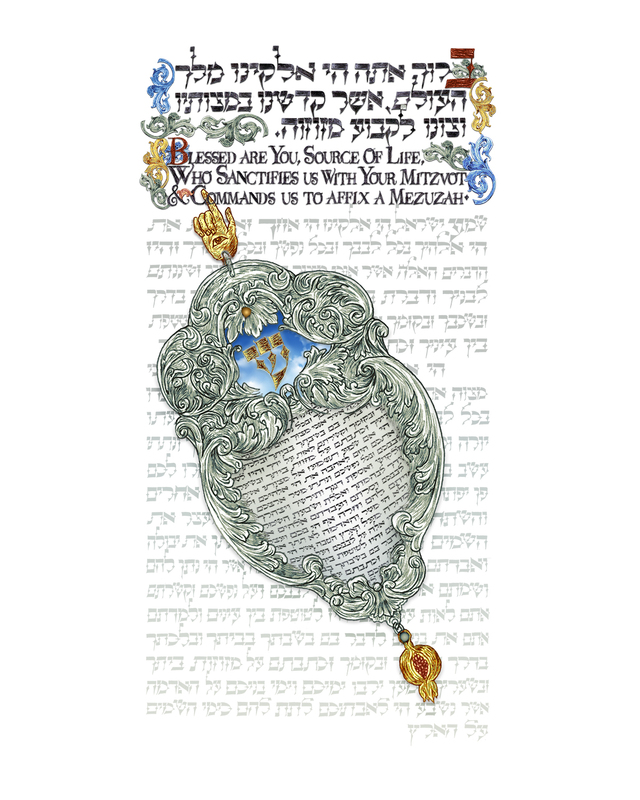 The timeless message in Parashah Eikev seems especially relevant now, drawing our attention to the dangers in our media driven culture and political climate that are characterized by those who only wish to speak while forgetting to listen.